Peptide (C)KSMDESRLDRVKEYE, corresponding to amino acid residues 1185-1199 of rat SynGAP (Accession Q9QUH6). C-terminus. 1,2 Anti-SynGAP Antibody (#APZ-032), (1:400). 3,4. Anti-SynGAP Antibody, preincubated with the control peptide antigen. Immunohistochemical staining of perfusion-fixed frozen mouse and rat brain sections using Anti-SynGAP Antibody (#APZ-032), (1:200), followed by goat-anti-rabbit-AlexaFluor-488. 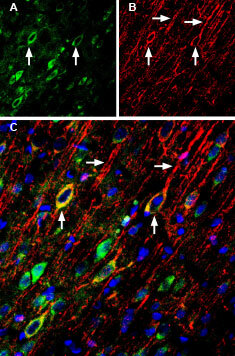 A. SynGAP staining (green) in mouse brain is detected in neuropil (arrows) in the globus pallidus (GP) that is markedly stronger than in the striatum. B. SynGAP staining in rat brain sections shows lateral septum labeling of profiles of neuronal processes (horizontal arrows). Cell nuclei are stained with DAPI (blue). Jeyabalan, N. and Clement, J.P. (2016) Front. Cell. Neurosci. 10, 32. SynGAP1 is a major signaling protein that plays a pivotal role in regulating fundamental molecular changes in dendritic spine synaptic morphological and functional modifications. SynGAP1 functions as a downstream component of NMDA receptor-associated signaling and of AMPA receptor trafficking to excitatory postsynaptic membrane. SynGAP1 is mainly expressed in the hippocampus and cortex. SynGAP1 is a cytosolic protein without a signal peptide or any transmembrane domain. The N-terminal half of SYNGAP1 has a Ras-GAP domain, along with the region that is loosely homologous to Pleckstrin homology and a C2 domain which is potentially involved in binding Ca2+ and phospholipids. Interestingly, the alignment of GAP domain of SynGAP1 with other Ras-GAPs suggests that the amino acids in the GAP domain are crucial for interacting with Ras and for stimulating Ras-GTPase activity. The C-terminal half consists of a repeat of 10 histidines that may be involved in metal chelation, several potential serine and tyrosine phosphorylation sites and a T/SXV motif necessary for interaction with SAP102 and PSD-95. SynGAP1 has been implicated in the pathogenesis of intellectual disability. de novo out-of-frame deletions were identified in patients with intellectual disability presenting with microcephaly and generalized epilepsy while de novo microdeletions in chromosome region 6p21.3 were observed in patients with severe language impairment in addition to epilepsy. SynGAP1 may also be involved in the pathogenesis of schizophrenia through altered regulation of the NMDA receptor complex. Anti-SynGAP Antibody (#APZ-032) is a highly selective antibody directed against an epitope of the rat protein. The antibody can be used in western blot and immunohistochemistry applications. It has been designed to recognize SynGAP from human, mouse, and rat samples.